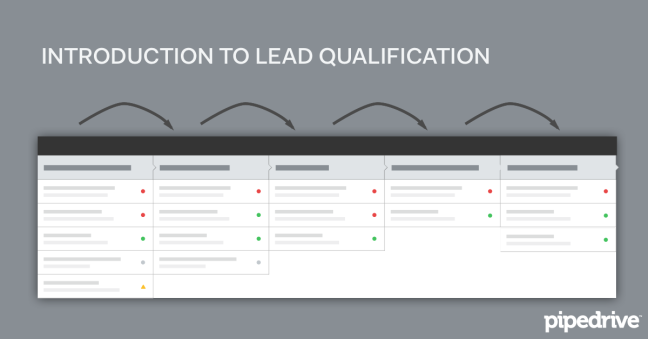 The lead qualification process is a lot like the hiring process. As an employer, your task is to narrow a large pool of job applicants to a select number of leading candidates. This smaller, vetted group of candidates is more likely to provide your company with a good return on investment. It’s a way to stack the odds in your favor, and ensure the company’s time, energy and resources are channeled into a worthwhile opportunity. Similarly, part of a salesperson’s job is to prioritize a group of potential customers based on their chances of conversion, and qualified leads are those potential customers most likely to convert. But to qualify a lead, you must assess a certain set of criteria. When it comes to potential customers, a pecking order exists. Lowest on the list: buyers. These individuals or companies are merely capable of buying your product or service. Next: prospects. Prospects are not only capable of buying your product or service, they also have a need for it. Then: leads. Leads show actual signs of buying behavior toward your product or service. Qualified leads are the most sought after potential customer. These leads not only express buying behavior, they have the authority, need, urgency and money (ANUM) to make a purchase. Thus, a qualified lead is further along in the sales cycle, and more likely to buy your product or service than an unqualified lead. Developed by Inside Sales, the ANUM framework offers a list of criteria for a qualified lead to meet, as well an ordered process for the salesperson to follow. ANUM places the highest value on identifying the authority figure and building a need with them. Urgency and money, while important, are only worth confirming if the authority and need is present. But there is more to a qualified lead than just ANUM. Jason Jordan, partner at the sales management firm Vantage Point Performance, argues that a qualified lead must be an opportunity that your company can win, as well as an opportunity that your company wants to win. “That means that it fits within your stated go-to-market strategy – the type of customer and the type of product that you want to sell,” Jordan said. Echoing Jordan, Richard Harris of The Harris Consulting Group said that, apart from ANUM, a qualified lead must fit your company’s ideal customer profile (ICP). “An ICP is a set of common attributes, milestones, or similarities that exist among your desired customer base,” Harris said. Although there is no universal definition of a qualified lead, the combined criteria of Harris, Jason, and ANUM provide a comprehensive working model. Thus, a qualified lead is a potential customer you can win, want to win, fits your ICP, and possesses the authority, need, urgency and money to make a purchase. It may not be the prettiest definition, but it can satisfy nearly any situation. ANUM dictates that establishing a lead’s buying authority takes precedence over all else. If the lead is an individual, this shouldn’t be too difficult, but if it’s a business, you’re going to have to locate the right person within the organization. This can be tricky. To find the person with buying authority in a multilevel business, Harris suggested that salespeople target the account on various levels simultaneously. Contacting multiple people at once can increase response times and get you to an authority figure faster. If you reach someone from upper management, and the person with buying authority is an end user, upper management can refer you down. Conversely, if you reach an end user, and the person with buying authority is in upper management, the end user can refer you up. How does your organization make buying decisions when it comes to products like ours? Aside from yourself, is anyone else involved in these buying decisions? Should they be included in this conversation? How do you think they will feel about purchasing our product? If a lead doesn’t need what you’re selling, why would they buy it? A lead might need your product or service if it solves a pain point, improves a process, or offers a new – and better – way to accomplish a task. The presence or absence of this need can determine the outcome of a sale, which is why it’s necessary to establish that need with the authority figure and build on it. Understanding someone’s business needs is best done through a consultative sales approach. Consultative selling is a sales philosophy that hinges on an authentic relationship between seller and buyer. Rather than pitch to the buyer, a consultative seller asks the buyer questions that reveal a need and encourage them to think more critically about the business implications of their current solutions. Can you take me through your procurement process? Do you experience quality issues? How long does it take to resolve those issues? What are the business ramifications of those issues? If you establish a buyer’s need, the next step is to determine how much of a priority it is for them to fulfill that need. If it’s a high priority, you can check off Urgency and move on to Money. If it’s a low priority, you might want to focus on other leads. There are many ways to measure a lead’s urgency. You can read press materials, such as press releases and news articles, to learn of any recent developments that might affect a lead’s urgency to buy. Perhaps the company is going through a large merger and consequently might not have the time to consider your product or service. Maybe the company recently reported that profits were down, and your product or solution would go a long way in recouping costs. How important is it for you to solve this issue? When do you want this issue to be solved? How bad would this issue have to get for it to move up on your list of priorities? When Ariana Amplo first started InHub, an online request for proposal platform, she assumed that the company’s $10,000 package would be too expensive for groups that had a retirement plan of less than $100 million. At least, that was until a smaller client signed up for the package after one phone call. “Ever since then, we let the potential client tell us their budget, not the other way around,” Amplo said. Amplo’s experience illustrates a larger point: Never qualify or disqualify a lead’s budget based on assumptions alone. If you read a press release announcing a new round of funding, don’t let your excitement get in the way of confirming a lead’s authority, need and urgency. If you learn of recent budget cuts, don’t chuck the lead without first speaking to someone personally. Do you have a budget allotted to this type of purchase? If you don’t mind sharing, what is it? How much would you spend to solve your current issues? What would you expect our solution to deliver for it to be a wise financial investment? If you’ve cross-checked all your potential customers with ANUM, you should have two piles of leads: qualified and unqualified. What you do with the unqualified leads is up to you, but when it comes to the qualified ones, it’s a no-brainer. These are the leads with the highest likelihood of conversion, meaning that the time, energy and resources you put into closing them will pay off. They’re not just potential customers anymore; they’re opportunities, and it’s time to seize them.